While I love attending the IMEX America Show in Las Vegas each October, it’s tough for me to find the time to get to other educational conferences aimed at meeting, convention, trade show, and incentive-program planners. However, some of my colleagues will attend various industry shows, and then I get to pick their brains about the cool ideas they saw and heard about at each event. In fact, one industry event that took place just recently was the Convening Leaders Conference, which is run by the Professional Convention Management Association. That show always happens within the first two weeks of the new year, so it really sets up attendees with ideas they can implement across their meetings and incentive programs later in the year. And from the reports I got from people who attended the Convening Leaders conference, there were some cool event-design concepts that the show used to keep attendees interested, and which attendees could also use for their own events. 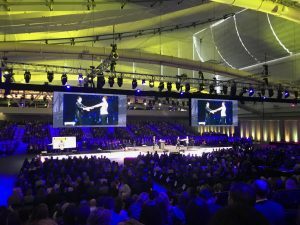 Here are two ideas from the PCMA conference that caught the eye of my colleagues, for one very good reason: They are event concepts that we at AIC Hotel Group can implement for meeting and incentive groups who use our properties in Mexico, Dominican Republic, and Miami. Idea #1: A main stage that’s centered in the ballroom, with the audience seated on either side and video boards above the stage to project close-up shots. This type of stage set used to be difficult, but technology makes it much simpler now–and the energy and excitement it creates for the audience is unmistakable. 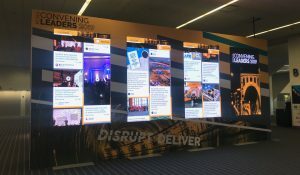 Idea #2: A scrolling social media board that we could set up in your pre-function space, so attendees can see what their colleagues are posting about their experience. What’s more, the fourth column on the far right can scroll the schedule of events for that day. A video board like this acts not only encourages people to post photos and commentary to your social media channels, but it also acts as a great natural gathering spot for people during the entire event. In fact, we can even set up comfortable seating and refreshments in front of the board, making that area a lounge where great conversations happen. I hope these ideas spur your creativity a bit as you think about event design for upcoming meetings and incentives. And if you’d like to talk about how else we at AIC Hotel Group can create event spaces that excite your attendees, I’d love to hear from you.